As well as being a land of olive groves and medieval hill-top towns, the region of Istria in Croatia is home to the highly prized white truffle. Always wanting to experience the best of any region and having heard how the largest truffle in world was found here, we set out on a truffle hunt. 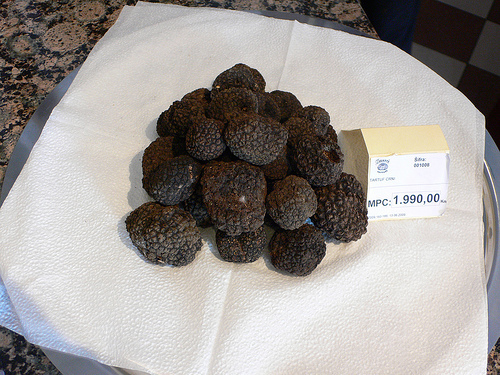 As every gourmet knows the truffles are at their best in the autumn and winter months and as we were there in August, I had to content myself with truffle hunting on a plate rather than at the roots of some woodland oak tree. This highly prized knobbly fungus is found around the town of Motovan where the Mirna river helps provide the moist woodland soil where truffles thrive. We stopped at the nearby village of Livade where in October and November a Truffle festival is held and all year round you can visit the Zigante restaurant and shop, devoted to truffles.